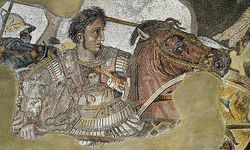 In the aftermath of the death of Alexander the Great his Empire fell into the hands of a series of ambitious warlords who sought to seize as much land and power as they could. The majority of these were former commanders in Alexander’s army and were Macedonian nobles. However, one of the successors or Diadochi of Alexander was a Greek by the name of Eumenes of Cardia (361 – 316 BC). Eumenes became one of the leading players in the first two wars of the Diadochi and he showed a considerable military aptitude. Eumenes is now largely forgotten figure but he had a decisive impact on the Hellenistic World. Despite being one of the few Greeks in the Macedonian army, he attempted to ensure that the Argead dynasty of Macedonia remained the monarchs of a united Empire. If he had succeeded he would have changed the course of the Hellenistic World. Eumenes was probably born in Cardia and was of Greek origin. His father came into the service of the Macedonian monarchs of the ancient Argead dynasty, and it seems likely that Eumenes was a member of the nobility. There are tales that he was the son of a wagoner, but this is not likely to be true. Most likely, the young Eumenes came to the attention of King Phillip II and soon became part of his inner circle and friendly with the young Alexander the Great. Eumenes remained close to Alexander until his death. Eumenes also accompanied Alexander on his conquest of the Persian Empire. He was to eventually become in 330 BC Alexander’s principal secretary and keeper of the Royal Archives. While this was not a particularly glamorous position, but it gave Eumenes real power and demonstrated that Alexander trusted him. Eumenes played a central role in the administration of the territories conquered by the great king. It seems that during the invasion of India that Eumenes was given command of a military unit and gained invaluable experience. However, he was often in conflict with Alexander’s best friend and probable lover Hephastion, but despite this, he remained in the conqueror’s favor. When the great king died in 323 BC in Babylon, he was present and was appointed as governor of the yet- unconquered province of Cappadocia in what is now northern Turkey. With the support of Peridiccas, the titular head of the Royal army he was able to subdue this area and made it his power base. Perdicas wanted the Macedonian Royal family to continue to rule a united Empire, albeit under his regency. However, many Macedonian generals or satraps had different ideas and wanted to create their own independent kingdoms. By 321 Perdiccas was the most powerful of all the successors, and he controlled all Asia, and this led to a great deal of resentment from the satraps who feared he was growing too powerful. In 321 BC Antipater send Craterus into Asia Minor, from Macedonia, where he was to be joined by the satrap of Armenia in an attack on Perdiccas. He was on his way to Egypt to deal with Ptolemy and he placed Eumenes in charge of Asia Minor despite his lack of military experience. The former secretary and scholar was a natural leader and inflicted a serious defeat on the satrap of Armenia. However, this satrap was able to unite his forces with Craterus and threated Eumenes province of Cappadocia. At a battle on the borders of Cappadocia (320 BC), Eumenes inflicted a devastating defeat on his enemies and killed one of the enemy commanders in single combat. This made the Greek master of all Asia Minor. However, his senior commander Perdiccas was assassinated by his own commanders. At the the settlement made at Triparadisus (320 BC), the various generals divided the Empire among themselves. When the political situation suddenly changed, Antigonus offered Eumenes the role of his second in command in his army because he recognized Eumenes military accomplishments. As part of this settlement he was given control of the Royal Treasury and the elite Silver Shields, the seasoned veterans of Alexander’s army. However, Eumenes, unlike Antigonus, fervently believed in a united Empire and one that was headed by a member of the Royal House of Macedonia. Eumenes would eventually alienate him from Antigonus. After the death of Antipater, Polyperchon became regent (319 AD) and was in possession of the Royal Family and was the only legitimate authority in the Empire in the eyes of many. He asked Eumenes to change sides and to support the family of Alexander. The Greek agreed and betrayed Antignous and entered into an alliance with Polyperchon and the Royal Family. Indeed, it seems that he was even in regular contact with Alexander’s sister Cleopatra. Antigonus was by now the most powerful successor of Alexander and sought to crush Eumenes and Polyperchon who represented the royalist cause. This split led to the Second War of Diadochi. In the naval battle of the Bosporus (318), Antignous defeated the royalist fleet and thus isolated Eumenes from Polyperchon, who fought a civil war against Casander in Macedonia, with the backing of Alexander’s mother, Olympia. The one-eyed general used his superior numbers to put great pressure on Eumenes. However, the Eumenes was resourceful and built up an army. On one occasion Eumenes was nearly ambushed by the Macedonian, but intelligence sent by Cleopatra saved him. He was forced out of Asia Minor and briefly occupied Phoenicia (Lebanon) after beating Ptolemy’s Egyptian forces. Antigonus pursued Eumenes and propelled him further east with his army. After a series of small battles in which he inflicted minor defeats of the Antigonid army, Eumenes then took his forces into modern Iraq and Iran. He often claimed to have received messages from the great conqueror in his dreams and associated himself with the cult of Alexander by holding meetings with an empty throne where the spirit of the great monarch was meant to be seated. These religious messages allowed Eumenes, even though he was Greek, to gain the loyalty of the Macedonian hoplites, especially the Silver Shields. He has obtained the support of some eastern Satraps who had grown suspicious of Antigonus ambitions. The Antigonid army chased Eumenes. The two armies faced each other at Paraitakene, northeast of Susa, in what is now Iran in 317 BC. Eumenes, despite being outnumbered devised a brilliant strategy that almost overwhelmed his opponent. Eumenes defeated Antigonus who suffered heavy casualties, and Eumenes' army suffered only light casualties. The two armies then withdrew to their respective winter quarters. In 316 BC, the two armies met again in what is modern Iran at Gabiene (316 BC). Once again Alexander’s former private secretary demonstrated his military brilliance. He inflicted heavy casualties on Antigonus and won an inconclusive victory. Then a chance event ruined his moment of glory. His army’s baggage train was captured by Antigonid cavalry. This meant that all the personal wealth and the wives of the Sacred Band were in the hands of the Antigonid army. The elite hoplites sought their wealth and wives back from the one-eyes general. He agreed to their demands but on one condition that they hand over to him Eumenes. The Macedonian Silver Shields decided to betray the Greek general. According to Plutarch ‘’ they fell upon him, took away his sword, and bound his hands behind him with his own girdle.’’  Antigonus apparently only wanted to imprison him but his generals demanded that Eumenes be executed. After weeks of indecision the Macedonian general reluctantly had his one-time ally killed. This was the de-facto end of the Second Diadochi War and left Antigonus as the ruler of most of the former Empire of Alexander the Great. Eumenes was an outstanding leader and general. He was a key player in the first two wars of the successors of Alexander. His brilliant victory over Craterus meant that the cause of Perdicas was not lost, even after his assassination. His continued defiance in Asia Minor of Antigonus meant that the War of the First Diadochi was prolonged even after the death of Perdicas. Moreover, his defeat of Craterus, one of the most popular Macedonian generals, removed someone who could have become a major player in the events of the time. The former private secretary of Alexander played an even more significant role in the Second Diadochi War. His decision to break with Antigonus and become the ally of Polyperchon and the Macedonian royal family lead to the overthrow of the Triparadisus settlement (320 BC). In effect, Eumenes success made another round of civil wars inevitable. His decision to throw in his lot with the Regent and the relatives of Alexander was one of the sparks that ignited the second war of the successors. He was arguably someone who destabilized the territories that were conquered by the phalanxes of Alexander. Crucial to understanding Eumenes was his desire to maintain the unity of the Empire. Many believe that he was the only successor who believed in Alexander’s desire to unite east and west. Because he was not a Macedonian and he did not believe in the exclusion of the conquered peoples from the army and government. This belief was not shared by the other successors and they firmly believed that the Macedonians should form a ruling military elite. Eumenes was the last hope of the Argead dynasty and his defeat meant that no Macedonian monarch would ever rule the lands won by the son of Phillip II. If Eumenes had won it is possible that one of the descendants of Alexander could have united the Empire. Instead, soon after the defeat of Eumenes, the last Argead king Alexander IV was murdered, even though he was only a boy which effectively ended the almost 500-year-old dynasty. Eumenes was an extraordinary man. Despite his limited military experience, he proved to be a brilliant leader and military tactician. However, he ultimately failed to accomplish his goals and protect Alexander's legacy. His impact on the development of the Hellenistic World was negligible. His determination and strategy helped only to prolong the First War of the Diadochi. His was also a very significant factor in the Second Diadochi War and this lead to a civil war and the fragmentation of Alexander's Empire. He attempted to keep alive the vision of Alexander of a great and unified Empire that would enable the unification of European and non-European, but he failed. Moreover, with his defeat, which marked the end of the Second Diadochi War which led to the destruction of Argead dynasty. Bosworth, A. "History and artifice in Plutarch’s Eumenes." In Plutarch and the historical tradition, pp. 64-97 (London, Routledge, 2002). Meeus, Alexander. "Alexander’s Image in the Age of the Successors." Alexander the Great: A New History (2009): 235-250. This page was last edited on 22 January 2019, at 17:22.